The arms, legs, neck & head controls can all be set to not orient with the joint directly above so as to allow the parents to be manipulated without fear of changing pre-adjusted limb orientations. Select the left clavicle control (CTL_L_Clav1) then rotate to raise and lower it. Notice how the right arm orients with the clavicle. With the left shoulder control (CTL_L_ShoulderFk1) selected, change the Parent value in the Channel Box from Local to World. Now once more select the left clavicle control and raise and lower it. Notice how the right arm does not re-orient, allowing for individual posing of the clavicle. 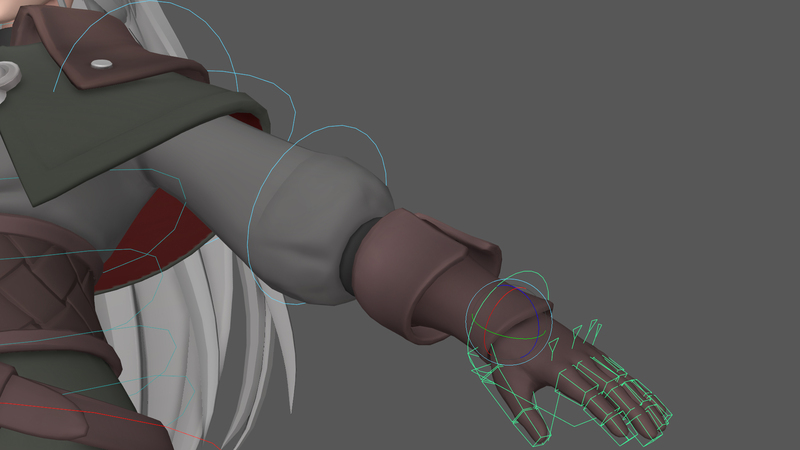 This allows the clavicles, pelvis, neck and head to be manipulated to better serve the pose of a raised arm (or FK leg), and importantly reduces the need to counter-animate joints like the neck and head when the body is turning for the character to retain their facing direction. 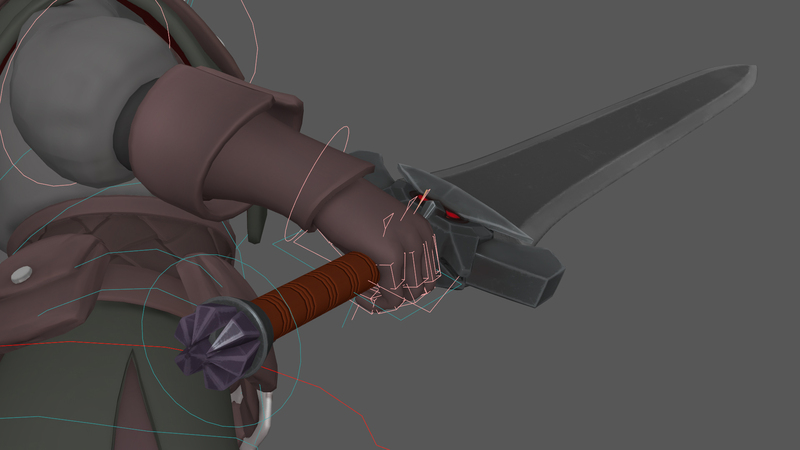 Similarly to the limb orientation, the sword position and orientation can be set to move relative to a variety of AZRI’s other controls, allowing her to hold the sword in either hand, carry it on her back, or not attach at all. Select the circular sword control (CTL_C_Weapon1) at its hilt, and in the Channel Box look for the Parent value. Swap between World (default), Root, Spine, L_Grip and R_Grip to attach it to these body-parts. As with other parent switches, this value can be keyed to change mid-animation so the sword can be passed from hand-to-hand, holstered and unholstered on her back, or drop/land separate from the character. Importantly, the left hand IK control (CTL_L_HandIk1) can be set to move with the right for two-handed actions, so you need only animate the right arm during a sword swing (for example) and the other will follow in IK. Do this by setting the left hand to IK and switching its Parent value in the Channel Box﻿ to R_HandGrip. The feet default to IK movement due to more-often-than-not being attached to the ground. Selecting the box at their base moves the whole foot (ankle), while the smaller circle controls manipulate the toe and ball of the feet. Additional controls exist for fine-tuned foot movement. With the box-shaped left foot IK control (CTL_L_FootIK1) selected, manipulate the Channel Box value for Foot Roll (by highlighting it and middle-mouse-dragging) to roll the foot forward and backward relative to the toe and heel respectively. 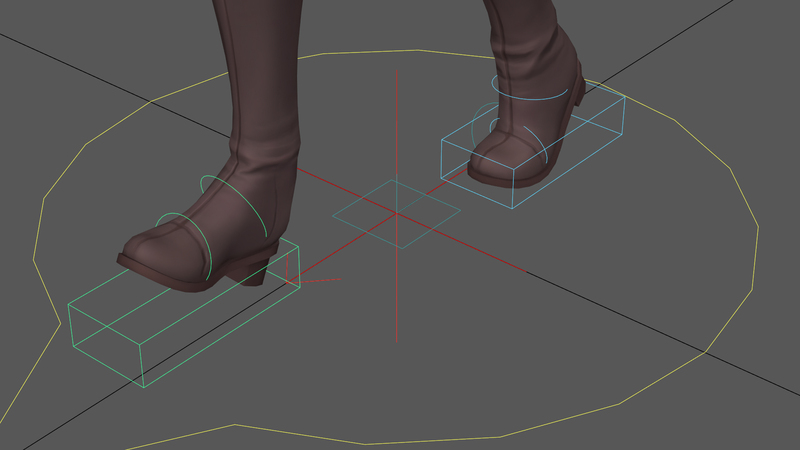 Similarly, with the left foot IK control still selected, the Channel Editor values for Toe Twist and Bank cause the foot to twist from the toe and bank respectively. Foot Roll can be especially useful for easier footstep motion in walk or run cycles, reducing the need to manipulate the orientation of the overall IK control which can prove complex. 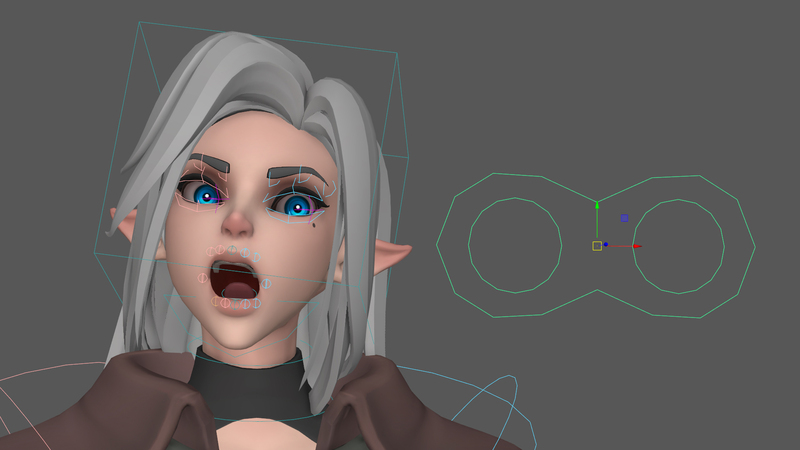 Under the Facial display layer lies AZRI’s facial controls. While most are basic joint manipulation, the eyes are more fully-featured to promote eye focus. Make the facial controls visible for the Layer Editor by selecting V in the leftmost box next to the Facial layer. Select the box-shaped head control (CTL_C_Head1) and rotate the head. Notice that the eyes continue to gaze forward. Each eye defaults to look at the individual left and right circular targets within the binocular-shaped look-at target in front of the head. Move the look-at target and note how the eyes follow. Select the arrow-like left and right eye controls (CTL_L_Eye1 & CTL_R_Eye1) and in the Channel Box set their Parent value to World. Now the eyes animate independent of the look-at target and the head control. With the left and right eye controls still selected, set their Parent value to Local. Now the eyes move with the head, though this is undesirable as the eyes can now look lifeless. Bringing the individual CTL_L_EyeLookAt1 and CTL_L_EyeLookAt1 together will allow the eyes to converge on a singe target, allowing the binocular-shaped look-at control (CTL_C_EyeLookAt1) to be moved forwards and backwards to instruct the eye’s focusing depth.